Partway through spring semester ’15, Kenn Von Roenn presented me with the opportunity for a summer internship. 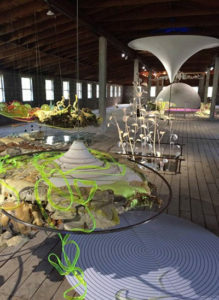 After discussing and expressing my interest in experimental, large-scale installations, Kenn connected me with Judy Pfaff. I had heard the name and I had seen a few works here and there, but after doing some research I was left pretty dumbfounded by the opportunity. Traveling all the way to New York, Judy invited me to live with her while working in her studio in Tivoli. Monday thru Friday I am in the studio from about 9AM until 5PM. A total of five of us spend our days at the studio. The property is large, there is always a lot to do and everyone works on everything. The first two weeks started off a bit slow with a lot of organizing of the many rooms in the studios and the garden, which is one of Judy’s most beloved places. I understand why—there is so much life. It’s no wonder she feels so inspired by the plant life she’s nurtured. Once I started to know where everything was and the order of things, the pace began to pick up and I expressed my enthusiasm to be more involved; she was very welcoming of it. Recently, Judy has been using the fish-eye affect on photographs she’s taken herself of her garden, places she has been, and even her own artwork. 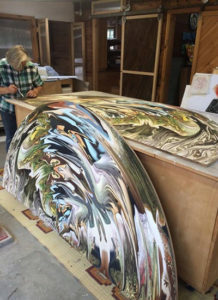 The photographs are then printed out in a number of sizes, all circular, mounted on wood and then sealed with a sparkling coat of resin. They are quite beautiful. I have helped with the resin and it may be my favorite task. It’s a cross between calming and mesmerizing. Almost two weeks back, we de-installed a solo show Judy did nearby. It never occurred to me the amount of labor and time it would take. I woke up sore after two days afterwards, but I learned so much about the planning, timing, and materials her pieces were made of through touch. In the first week of August, one of three shows is going up. The packing, counting, and planning for that show started before my arrival and now it is only three weeks away, so not a minute is spared. I enjoy working for her very much and especially cherish the time I’ve had getting to know her as a person outside of the studio. She is a very lively, fun, humble, and amazing woman. My greatest hope is to remain in contact with such a beautiful mind and soul. I am honored to intern for Judy Pfaff.